Viral infections remain a significant and persistent strain on healthcare systems worldwide. The mosquito-borne dengue virus (DENV), a member of flaviviridae family, infects nearly 100 million people per year. Additionally, Zika virus (ZIKV) has recently emerged as a cause of severe congenital anomalies in the unborn fetuses of infected mothers. Despite the burden of these diseases, few therapeutic and diagnostic options exist to treat and detect them. Biogenesis of flaviviral proteins occurs at the endoplasmic reticulum (ER) membrane and is translated from the ~11 kilobase DENV or ZIKV genomic RNAs. Viral RNA-protein interactions are essential to recruit and retain the viral gRNA to these ER sites and to mobilize cellular factors required for translation, replication, packaging, and in some cases has been proposed to be an important determinant of tissue tropism. We use technologies such as ChIRP-MS to comprehensively identify cellular RNA binding proteins that associate with viral genomic RNAs. 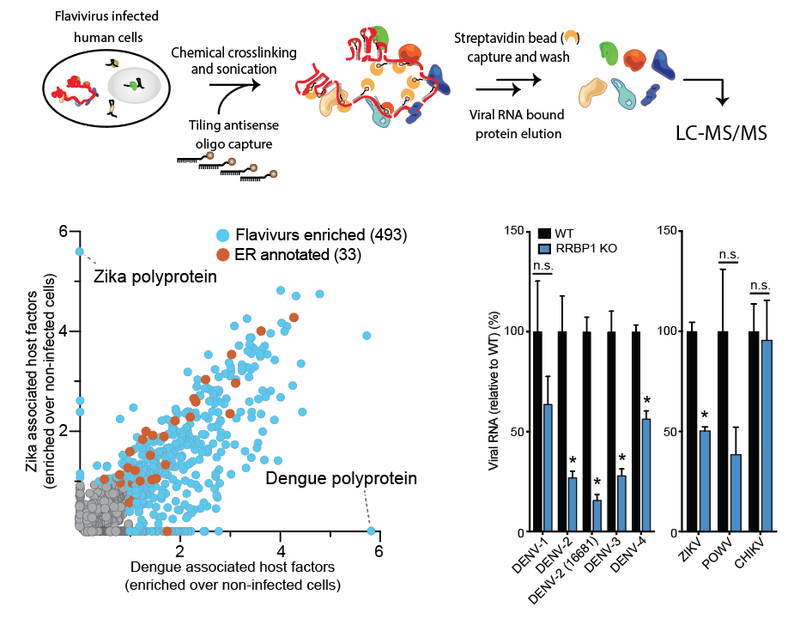 Combining these interactome data with genome-scale CRISPR-KO screens, in collaboration with the Carette lab at Stanford, facilities the identification of new and functional host proteins impacting viral biology. Insights from these studies has shed light on to specific ER RBPs that control the flaviviral life cycle as well as critical host translation of membrane and secreted proteins. DEAD-box RNA helicases are a large group (>20 in the family) of ATP-dependent enzymes that can unwind RNA duplexes. These helicases have been functionally implicated in nearly every step of RNA metabolism, from transcription and splicing, to translation and RNA degradation. 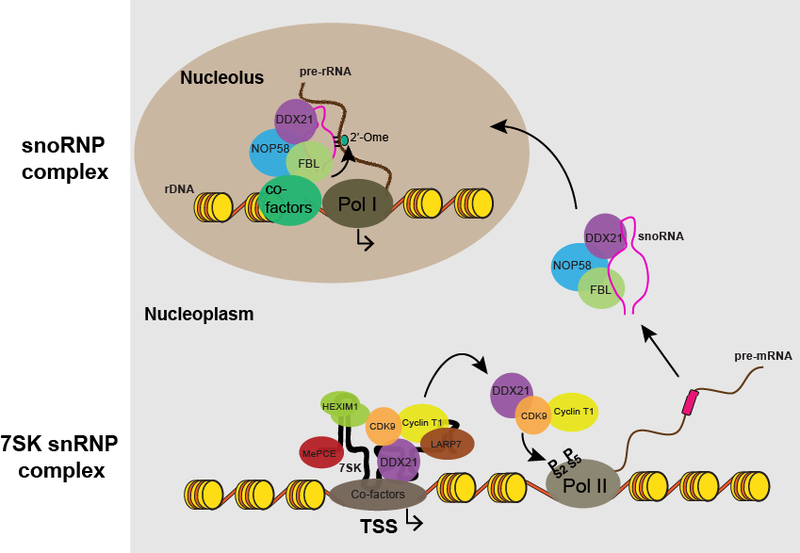 In collaboration with the Wysocka lab at Stanford, we uncovered DDX21 as a central regulator of ribosomal biogenesis in both the nucleolus and nucleoplasm. DDX21 acts to enhance Pol I transcription and subsequently controls post-transcriptional methylation of the ribosomal RNA. Additionally, it positively regulates Pol II transcription at ribosomal protein genes via the 7SK snRNA as a P-TEFb release factor. What regulates the localization and activity of DDX21 remains an active area of research. Exploration of additional DEAD-box proteins, and related RNA helicases, will provide key insights into the basic RNA-centric pathways. Efforts to understand which RNAs are targeted, the functional role for specific helicases, and the post-translational regulation of helicase are actively being pursued. RNA adopts complex physical conformations that control its function. Thus, our ability to determine the role RNA molecules play in biology is gated by our capacity to define the structural features of RNA, an in particular those features in the complex milieu of a living cell. Studying RNA structure is enable by new chemical tools coupled to deep sequencing technologies. in vivo CLICK Selective 2’ Hydroxyl Acylation and Profiling Experiment (icSHAPE) uses an azide-functionalize electrophilic reagent to read out nucleobase reactivity which is related to its single-strandedness. Psoralen Analysis of RNA Interactions by Sequencing (PARIS, and other psoralen-based technologies) directly identifies RNA duplexes that are generated from intra- or intermolecular RNA interactions. 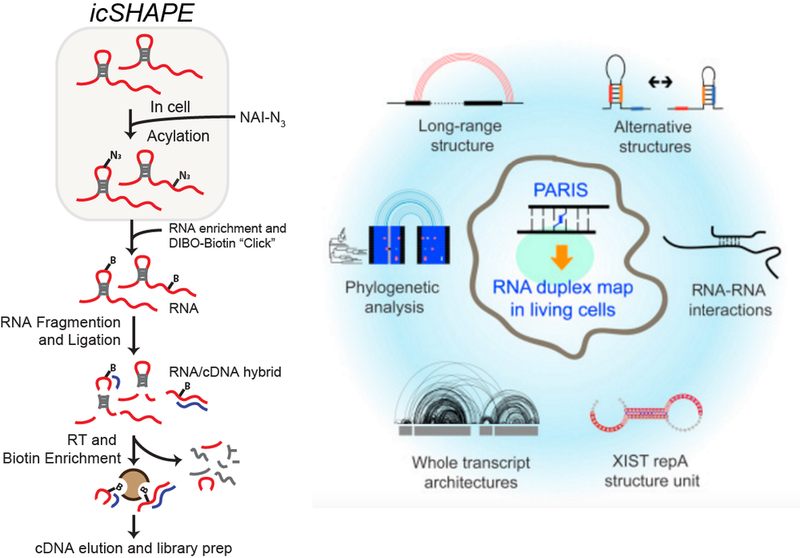 Together with the Spitale Lab at UCI, we are integrating icSHAPE, PARIS, and other structural techniques to develop an unbiased view into the complexities of the cellular transcriptome. The scientist does not study nature because it is useful; (s)he studies it because (s)he delights in it, and (s)he delights in it because it is beautiful. If nature were not beautiful, it would not be worth knowing, and if nature were not worth knowing , life would not be worth living.